Grand Central Terminal (often inaccurately referred to as Grand Central Station) is a beautiful Beaux-arts building in midtown Manhattan. First opened in 1913, Grand Central Terminal underwent a massive restoration to restore its former glory, and is now both a transportation hub, as well as a destination in itself for visitors to New York City. Travelers and commuters arrive at Grand Central via Metro-North trains that travel along the Harlem, Hudson and New Haven Lines to destinations in New York including Westchester and the Hudson Valley, as well as to Connecticut. Grand Central also serves as a hub for subway travel with service on the 4/5/6, 7 and S lines. "I'll meet you at the information booth at Grand Central." The terminal, a thruway for millions of commuters every week, offers many a chance to conjure up the romance of train travel. 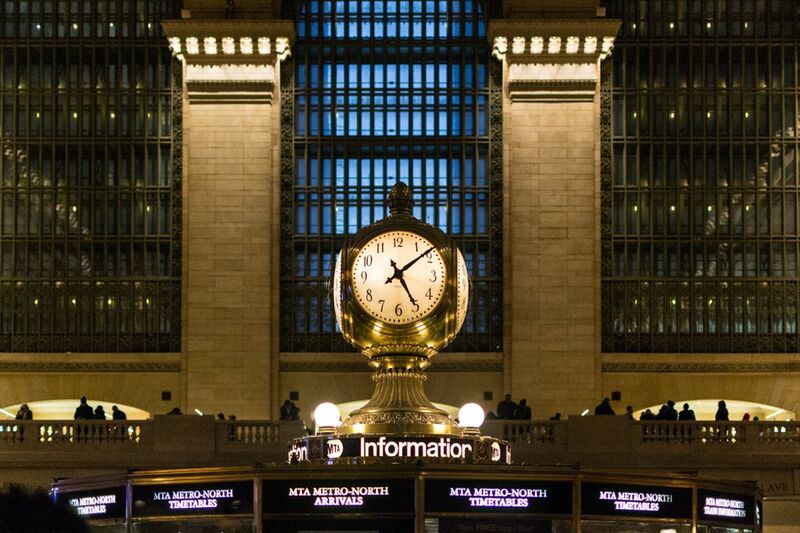 Built in 1913 and revitalized with shops and restaurants in the early 2000s, Grand Central holds many secrets that you only need to look closely to see. Atop the station is Campbell Apartment, '30s tycoon John W. Campbell's hideaway office and a luxurious escape from the bustle below. For great dining views, check out Michael Jordan's: The Steak House NYC on the west side of the concourse. You can also try Grand Central Oyster Bar to experience a classic NYC spot. Below the tracks are levels of shopping and dining-from clothiers to florists to souvenir shops. And often in Vanderbilt Hall visiting art exhibits and other events take place. And don't forget to look up in the main concourse. The illustrated blue-green cathedral ceiling offers a view of the nighttime sky, with constellations and other heavenly bodies-sometimes highlighted with a periodic zodiac laser show you may be lucky enough to catch. There is a great Grand Central app (free, available for iPhone and Android) that has very extensive information for visitors to Grand Central. The History section has both a timeline and a discover feature loaded with trivia and photos that make it easy to learn more about Grand Central even if you choose to explore on your own. If you want a guided experience, there is an audio tour available to rent in Grand Central and also available for download onto your phone. The Municipal Arts Society offers daily tours at 12:30. The terminal and surrounding buildings are heated by hot water pipes. The system was the largest of its kind when it was built and consists of over four miles of pipes. The railroads that make up Metro-North today were originally four competing lines: the Hudson River, New York Central, New York & Harlem and New York & New Haven. There have been several times throughout history when Grand Central Terminal was slated for demolition, but today the building is protected as a New York City landmark. Acorns and oak leaves throughout decorations in the terminal represent the Vanderbilt family motto: "Great oaks from little acorns grow." Admission: Free. Fares for Metro-North trains vary by destination.